Pioneers in the industry, we offer commercial reverse osmosis systems and stainless steel water purification plants from India. 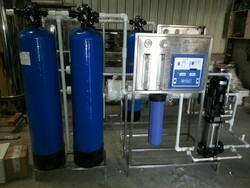 We are the leading and trusted supplier of Commercial Reverse Osmosis Systems. Mineral Water Plants.Schools, Colleges & Institutions.Hospitals & Nursing Homes.Pharmaceutical Industries.Swimming Pools And Water Parks.Residential & Housing Complexes.Hotels & Resorts.Food Processing Units.Dairy Plants.poultry Farms.Sea Food Exporters. One No. Of Vertical Mounted Multi Stage Centrifugal High Pressure Pump With Ss Construction. The High Pressure Pump Supply Raw Water With Pressure Of 12 To 15 Kg/cm2 To Ro Membranes, Where Permeate Is Separated. The Necessary Instruments Like High And Low Pressure Switch, Pressure Monitor And Requisite Isolation Valves Provided. 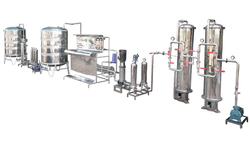 We hold expertise in offering a quality approved wide range of Water Purification Plants in the market. These products are highly admired for their optimum quality, robustness and high performance. With the availability in various specifications and models, these products are demanded and appreciated by various industries. Our products are available at reasonable market prices.